Everyone loves a good treasure story! And there are lost mines scattered all across the western United States! Millions of dollars in gold and silver, lost and still awaiting discovery! Take a look at our new 38-page eBook! Lost Gold Mines of the West - 21 Tales of Lost Gold & Silver Mines takes a look at some of the most famous stories of lost mines throughout the western United States. This eBook takes a look at 21 stories of lost mines in California, Oregon, New Mexico, Colorado, Utah, Nevada, Wyoming, Texas and British Columbia! This eBook is a great resource for anyone who loves a good treasure story, or has treasure hunting in their blood! During the early gold rush days, it was truly the "Wild West", full of robberies, Indian attacks, disease, and murder! And while some of these stories may just be "tales", some are believed to be true, genuine stories of lost gold and silver mines that have never been rediscovered. We are confident that this eBook will help you in your search for gold. If for any reason you are not satisfied, we will gladly give you a full refund. No questions. We offer this 30-day guarantee because we know that the contents of this ebook will help you in your search! There really is treasure out there waiting to be found! 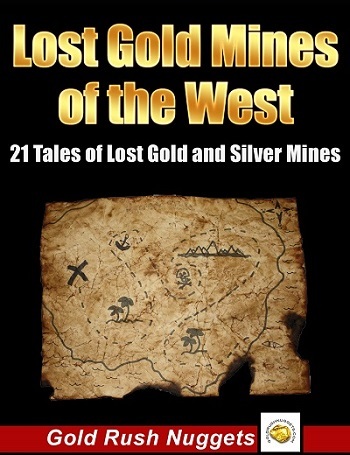 Want to learn more about lost mines of the West?